Everybody say "Yeah, Yeah!" 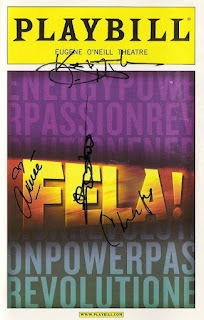 So begins the experience that is the unique and completely original musical FELA! I saw the show on Broadway in 2010 (where it ran for just over a year, winning three Tony Awards of eleven nominations), and it was unlike anything I've ever seen on a Broadway stage - the music, the dancing, the costumes, "original no artificiality!" The show and much of the original cast is at the Ordway this week, and it's just as dynamic as when I saw it in NYC. FELA! is based on the music and life of Fela Kuti, a Nigerian musician and activist who became popular in the 1960s and 70s. He developed a style of music called Afrobeat, "a complex fusion of jazz, funk, Ghanaian/Nigerian High-life, psychedelic rock, and traditional West African chants and rhythms." I'm not sure what all of that means, but the combination is pretty awesome. 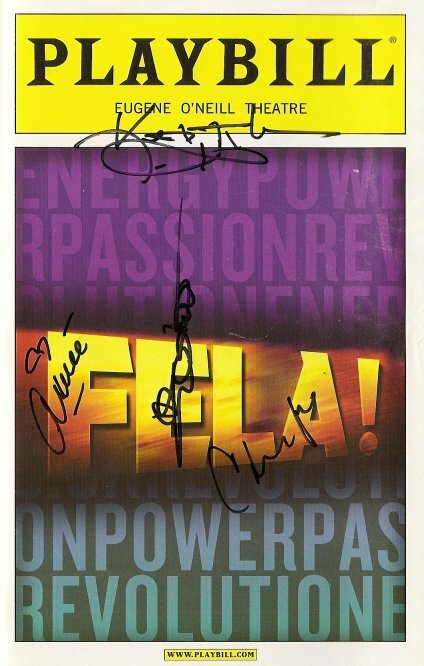 The musical is structured as one of Fela's concerts at his club in Lagos, Nigeria - the Afrika Shrine. Fela tells stories of his life, family, and country, and shares his music with the audience in an interactive way. The audience is part of the show, and the more they play along, the more fun everyone has. Be prepared to get on your feet and dance a little, but don't worry, if you can read a clock, you can follow along. :) But it's not all fun and easy. Fela talks about his travels to America, where he became inspired by the Black Power movement. Upon his return to Nigeria, he used his music to express his political views which were not popular with the government, resulting in the government raiding his compound, severely beating Fela and causing the death of his mother. Sahr Ngaujah (who was nominated for a Tony for playing this role on Broadway) completely embodies Fela Kuti and brings him to life before our eyes. There's no evidence of "acting;" he simply is this character. Telling stories, singing, playing the saxophone, dancing, leading the band, he never stops. There's a large band on stage and they are amazing. 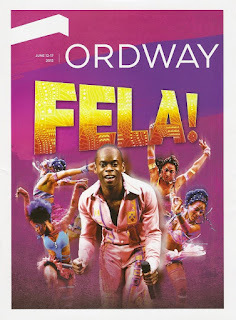 As interesting as Fela's life is, it's the music and dance that drive this show. The entire ensemble is comprised of talented dancer/athletes. Before the show I participated in the Ordway's Summer Dance Series (free dance lessons of a different style every Thursday through the summer) which this week was, appropriately, African dance. I was sweating and exhausted after 40 minutes of it, and it was nowhere near the complexity and difficulty of what the cast of FELA! does. I wish they would make a workout DVD; these dancers have the best abs I've ever seen! They're in incredible shape, and it's from doing that eight times a week. I recognized a few familiar faces among the ensemble; many of them were part of the original Broadway cast. And they'll have another chance on Broadway - the tour returns to NYC this summer. The production makes good use of videos and photos projected onto the walls of the theater, as well as lighting that extends into the audience. Marina Draghici won a Tony for the costumes of FELA!, and deservedly so. They're a really cool mix of traditional African and 70s hippie style, and most importantly, they allow the dancers to move. The women wear fringed skirts that are never still, and the men wear 70s plaid pants and open (or no) shirts. Fela himself dresses in elaborate pastel pantsuits. Another Tony-winner from this show is Bill T. Jones for choreography. He also also co-created and co-wrote the show (with Jim Lewis), and directs the show (and he won a Tony for the choreography of Spring Awakening, so different but equally striking). 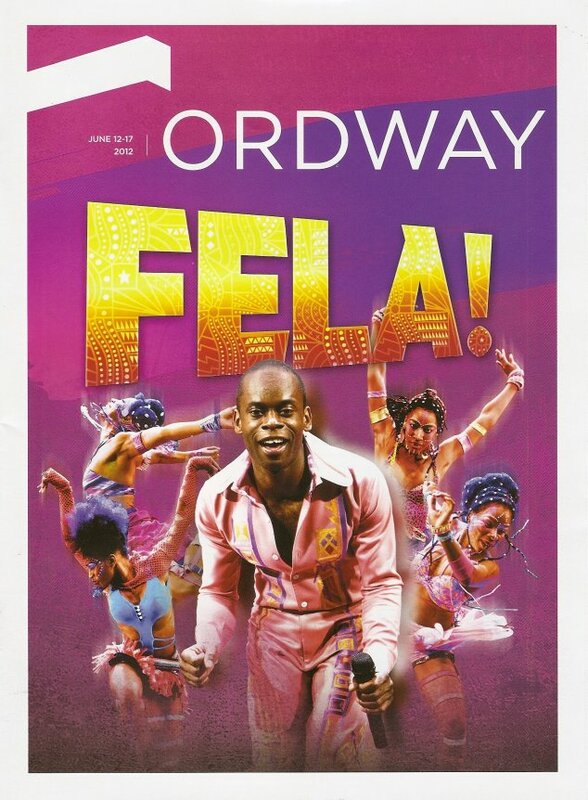 Words are not adequate to describe the music and dance of FELA!, so here's a look at their Tony Awards performance two years ago, featuring Sahr as Fela and much of the same cast that's currently in St. Paul. Only three performances remain before they pack up and head to NYC, so act fast!